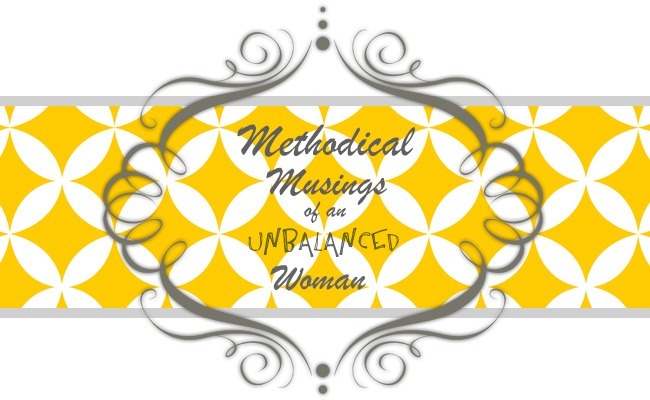 Methodical Musings of an Unbalanced Woman: Diving, Surviving, or Thriving? While in each phase I did experience some temporary fluctuations (higher and lower), these were my general feelings. This is the phase where I was actively experiencing symptoms of depression and anxiety (for most people the two come hand in hand). Even my "diving" phase had it's own phases. Phase I-- Out of control irritability, anger, rage and constant worry. I was so mad. ALL OF THE TIME! Despite that, I still held up really well in public (I'm a good actress I guess). I enjoyed being social (in fact, couldn't wait to get out of the house), still smiled (when I wasn't at home that is) and loved my job as an aerobics instructor. In fact, I had no idea I was depressed. I was just mad. I thought you had to be weepy and withdrawn to be depressed. It wasn't until my husband lost his job and we moved in with my in-laws (with our three kids) that I really hit rock bottom. Phase 2--On top of the irritability, anger and rage, I began experiencing feeling of hopelessness, overwhelming sadness, and emptiness. I was without care for anything or anyone. I even dreaded going to work. I couldn't think clearly and tried to find excuses so I didn't have to go out, even with my closest friends. It just took too much effort to pretend to be happy any longer. I felt like I was "diving" further and further into a bleak, dark hole from where there was no return. Every day was a bad day. I would go to bed each night feeling angry at everyone around me (because everything bad/mean I did was THEIR fault for provoking me) and I would DREAD having to wake up and do it all over again. That's when I finally accepted that maybe...just maybe, I was depressed. After seeking help (by working with my doctor and a counselor) I finally started to feel a lot better. Life was looking up for me. Gone was the constant irritability which would trigger the anger and rage. Gone were the feeling of hopelessness, emptiness, and sadness. I cared about my family again and I wanted good things for us. And I was willing to TRY and do something about it. I was making improvements in my relationships, friendships, and overall well being. I didn't hate myself and everyone else at the end of each day. That was a HUGE improvement. But I still didn't have it all together. Something was still missing. I was still having a difficult time putting two thoughts together. I couldn't even finish my sentences. I just felt like I was hanging on from day to day ("just get through today...just get through today," I would tell myself) and while my days weren't BAD, they weren't GOOD either. I took my recovery a step further and began taking a supplemental form of Folic Acid (5-MTHF) recommended to me by a local physician (Dr. Neil Rawlings) because of a common genetic disorder called MTHFR (methylenetetrahydrofolate reductase) I had tested positive for. Read more about it here. It made ALL the difference!!! I went from feeling okay to feeling GREAT. We (my husband and I) call it the"gung ho" stage. I'm happy. Really happy (no, not all of the time...that would be unrealistic). I'm experiencing feeling that have been dead and buried for SO LONG. I have GOOD DAYS! I have LOTS of GOOD DAYS! I get excited, I look forward to things, I want to accomplish things again (which is a little overwhelming for my husband sometimes) and when I smile...I actually mean it. Oh...and I actually have whole, complete thoughts in my head....and they even come out that way sometimes. It feels good. It feels REALLY good. I didn't think I would ever feel this way again. I want to ask you....WHERE ARE YOU? Which "phase" are you in? When was the last time you had a bad day? When was the last time you had a GOOD DAY? Your life journey and your honesty about it is so inspiring and courageous! It's SCARY and not always easy to share but I feel the need to do it, so I do. Yup. You're my emotional twin, alright. And I am a super actress as well. One of the most insightful things my ex ever said was this: people would approach him and say "it must be so fun to live with J.! She's so outgoing and happy all of the time." and he would respond "that's just it. You DON'T live with her." Here's to Methylfolate and the "good...no...GREAT life!" Can you let me know where you get your supplement? I have just tested positive for this as well and my symptoms are definitely in the DIVING catagory. I've been asking for drs. for years how to turn off the aggitation and anger. I was such a happy child and teen, it was really after college this started slowly, now with 3 kids I want to be joyful but am having issues beyond my control. Have taken 5 different antidepressants with extreme reactions to each. Just tested positive for this last month. I'm LDS too, 35 years old, mother of 3.. and have had 5 miscarriages. I have also suffered depression, chronic fatigue, poor sleep quality, and memory loss. I felt like I was living in the body of an 80 year old and I couldn't figure out why. Every quest I went on to find a way to live differently, feel differently, was a miserable failure. I had so many tests done, and doctors that would stare at me like I was a mutant - when actually that's kind of what I am. I learned just yesterday through a battery of tests from an RE that I have the same thing you do.. Compound Heterozygous MTHFR. Googling that has connected all the disjointed piece of my life back into some semblance of making sense. And I ran across your doctor.. I wanted to convince my RE to give me the other kind of folate.. not folic acid and wanted to know if Dr. Rawlins was holistic (at which normal medical doctors roll their eyes) or the kind he would listen to. Turns out he is the latter. and then I stumbled upon your blog and read a bit about how taking that active folate has changed your life. I burst into tears. My husband wondered what was wrong with me. You see.. I had nearly given up hope of ever feeling not tired.. of ever feeling like I could remember something longer than 3 seconds, and like a functional human being again. Your story sounds so much like mine, but with a happy ending. I WANT THAT ENDING! And all I have to do is seek a certain kind of vitamin? WOW.... Maybe it's worth the price tag difference between normal folic acid and the active kind. You've given me hope that there is life beyond tired and survival. I just wanted you to know that what you wrote managed to reach someone for good. My most recent blog post led a family member to have me read your blog. I am now looking into the MTHFR thing. I get really depressed and especially when I'm pregnant. I'd say I'm in between diving and surviving right now. Thanks for your willingness to share your story. How soon did you notice a difference? I'm getting tested tomorrow but will start my supplement ASAP. I'm not sure if this will be the answer to my anxiety and depression but I will be happy to know for sure. In answer to your question, it took several weeks. 3-4 at least. I hope that helps and that you find some answers. Don't lose hope. Wow, I was hoping sooner! Lol did you have side effects? Thanks for this wonderful blog!! Lu Lu's Mommie---I, personally, did not experience any side effects. Clinically, when tested people had more side effects on the placebo than the methylfolate. However, it does help the body shed toxins and some people do experience toxin shedding side effects. I didn't really...a few more zits at first but nothing more. What it DID do for me was take away all of the awful side effects of the anti-depressant. Hope that helps.